Diabetes is a complex disease with risk factors that range from obesity and high blood pressure to sedentary lifestyle and high fat and carbohydrate diets. The choices that people make that increase their risk for diabetes often result from the built environments in which they live, work, learn, and play. Understanding the root causes of diabetes means understanding environmental and behavioral information within a community. Obesity, a frequent precursor of diabetes, may be seen in neighborhoods with high concentrations of fast food restaurants and few or no stores selling healthy groceries. Knowing where specific risk factors are present provides valuable insight for effectively pinpointing the places where resources and education are needed most. For instance, GIS can identify locations that provide diabetes education, pharmacy locations, and sharps drop off points. 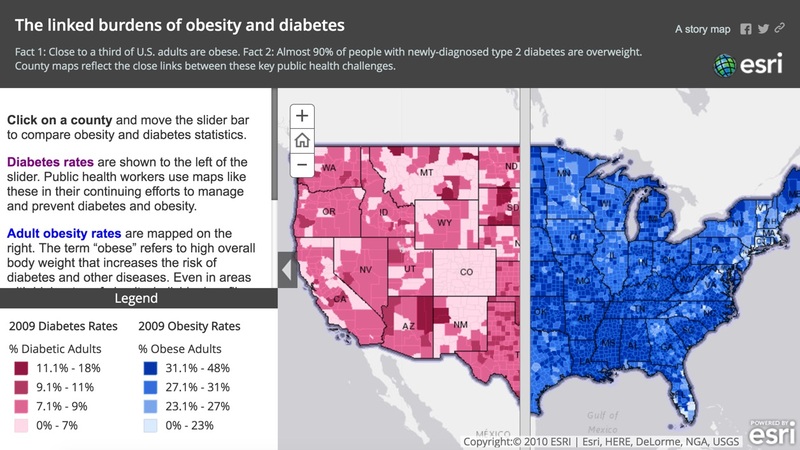 Esri’s interactive Story Maps offer an engaging way to spread awareness about diabetes, its risk factors, treatment, and prevention opportunities. One Story Map we created shows the link between national obesity rates in the United States and diabetes. Another Story Map, developed by Direct Relief with the National Association of Community Health Centers, shows the innovations in care related to diabetes.